News: O'Gara poised for Ireland return? Former Munster stars Alan Quinlan, Mick Galwey and Peter Clohessy are all adamant that Declan Kidney's time as Ireland coach should come to an end after the Six Nations. Kidney's current contract with the Irish Rugby Football Union finishes after the championship and it seems increasingly unlikely that he will be offered a new deal. His position as Ireland boss came under fire following their back-to-back losses to England and Scotland and last week ex-Irish international Tony Ward called for Harlequins boss Conor O'Shea to replace Kidney. While O'Shea has ruled himself out of the running, Clohessy, who played under Kidney between 1998 and 2002, claims the coach's time has come to an end. "He's had a great career but I think it's time for him to move on," Clohessy said while speaking at a fundraising event for the Mercy University Hospital foundation. "If I was him, I'd like to think he would be man enough to step down when his contract is over." And Quinlan, who was part of the Munster side that won Heineken Cup titles in 2006 and 2008, believes that some of Kidney's controversial decisions may have backfired when it came to re-negotiating his Ireland contract. He opted to pick Jamie Heaslip ahead of Brian O'Driscoll as Ireland skipper and also chose Paddy Jackson to start against Scotland in place of Ronan O'Gara. "He's under serious pressure," Quinlan said. "The decision with the captaincy was always going to be a big one for him. At the time I said there shouldn't be a big deal made of it and it was one of those that if Ireland had a great Six Nations, everybody would have said it was a great decision to make. "It was a bold decision and it has backfired on him. If you have a player like Brian O'Driscoll on the pitch, he's probably too big a player to not make captain. Jamie Heaslip was maybe intimidated by it, but then again if you're winning matches these issues wouldn't come up. "The Paddy Jackson decision was another big one. I had said before the game that O'Gara should have started because it was a game that Ireland were under pressure going into and they needed to get the scoreboard ticking-over with penalties. Even though O'Gara's general play hasn't been up to scratch, his goal-kicking is phenomenal." Ireland have two matches left in the Six Nations and welcome France to the Aviva stadium on Saturday. Regardless of the supporter's possible misgivings over Kidney, Galwey has called on the fans to get behind Ireland. "At this stage, I think we should be getting behind the team," Galwey said. "We are facing a French side who are coming off the back of three defeats next weekend and they will be fighting for a win at the Aviva. But whatever decisions Declan makes, I think we should respect and support the team. "We have to remember that Declan has done an awful lot for Irish rugby. even though it's time for him to go. 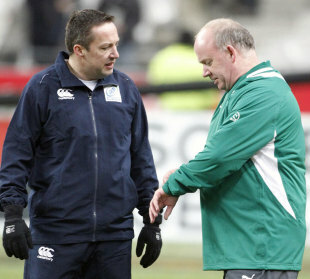 In the middle of the Six Nations, you can't change the coach. We have to stick with what we have for the next two games."